Dylan confessing he really likes Elle. Harold and Sky have sat down to discuss the issue. Harold asks if she is totally sure about this and well she couldn't be surer. Harold hopes that his opinion hasn't influenced her decision. SKY: Yeah right when has that ever happened? LOU: She's got you there mate! SKY: Granddad this is me we're talking about. Harold thinks it's a bit of a yes but no. Sky agrees but she just knows in her heart it's right. She is scared but she's made up her mind and she is so happy. So's good ol' Harold, he's so proud. Lou tells Sky she'll make a beautiful mother. Mishka decides that because there is ‘much joy' they should have some champagne. Lou goes to get it while she gets the glasses. Harold asks for just a juice but Mishka thinks that's ridiculous. Janae says it would be really cool if they could go to Bali for their honeymoon. Boyd agrees it would be but they have the small problem of not having any money. They need to win the lottery first. Janae tells him it's very cheap to go there now, and that they'd have two whole weeks of wearing nothing but bikinis. Now why would Boyd be wearing one? Boyd says that he could handle that and goes in for a smooch. Summer interrupts the kissiness scaring the happy couple. They get up to give her a hug and welcome her back, Boyd asking why she's back. Summer tells him she's back to help plan their wedding, and it's going to be *so* beautiful! She starts going through her bag to get magazines out while Boyd and Janae don't look so happy, Boyd asking if they should tell her. Summer catches the unhappy vibe and asks what's going on, if the wedding is still happening. Janae says it is, Boyd adding that they're the only enthusiastic ones. Everyone else are being ‘tools' about it so it makes it pretty hard for them to get excited about it. SUMMER: Have they all gone insane? Harold's toasting to the mother to be. They clink glasses and Sky barely gets one sip before Mishka takes her champagne away. That's okay because Sky isn't really into the stuff. Harold says that there is one more thing that needs to be done; talk to Dylan. Sky doesn't really want to. Harold reminds her that he is the father. Sky laughs and says he's thrilled! Harold can understand that the news would be hard for a young guy to digest but the most important thing here is the welfare of this baby. And them as parents, be it together or not, have a duty to this child to resolve any problems they may have. Sky says that Dylan wants nothing to do with her and won't be coming around anytime soon. Harold tells her it takes effort, they have to put themselves second to the baby. Dylan can't do it, he isn't ready it's total freaksville. Elle says how can anyone be ready until it happens. Dylan asks her why any kid would want to follow his lead. He's a high school dropout, ex-con, his old man never gave him anything to go on… he's a waste of space. Elle says that if he's a waste of space why is she sticking around. He's his own man, smart, caring, moral. Any kid would be lucky to have him as their dad. Anyway she's seen him with Oscar and he's great. Dylan tells her that Oscar likes him because he's a big kid himself. DYLAN: Let's face it, I'm just a screw up. Bree and Summer come inside after getting the mail, Bree asking for any juicy gossip from the Guild. Summer replies that she will after she goes and sees her dad, he thinks he's picking her up from the train station later. Bree opens up a letter from her publisher, thinking it's a royalty check. And is it! The girlie has $5000! Summer wants to go shopping with it but Bree is already giving it to the family because of her dad's pirated DVD bill. She goes to sit down at the dining room table and read another letter while Summer still stands in the lounge room flicking through a mag. Summer asks if it's a fan letter. Bree replies that it is but she seems a bit perturbed, saying that she should really get the check to the bank now. Summer says she'll catch her later and leaves Bree to sit back down and read the letter again. Hmm wonder what it's about. Harold let's Elle in, she come to see Sky obviously. He leaves them to it. Sky asks how Elle is because they haven't seen each other for a while. Elle says that she heard that Sky had changed her mind about becoming a mother, it's a bit of a shock. Sky says she had to think about it, but decided on this. ELLE: This being something that is going to totally change your life? All those things you wanted to achieve, gone. SKY: No Elle I can still do everything I wanted to do. I know this is right for me. ELLE: For you? So you're the only person involved here? What about Dylan's feelings? Have you thought about that? SKY: Elle I'm not entirely sure what you point is. ELLE: My point is Dylan is a part of this too and I don't think you've stopped to consider that. SKY: His involvement has been up there in my thoughts all along actually. And it's not my fault if he doesn't know how to communicate. What's it to you anyway? Why are you so concerned all of a sudden? ELLE: Because he's my boyfriend I care about him. Whoops what a slip up. After the break Elle realises that Sky had no ide about her and Dylan. She's really sorry that Sky had to find out this way. Sky asks how long it's been going for. Elle replies it's been a week, just before he found out about the baby. Sky's glad he's moved on, they all should. Elle says she's been meaning to tell her but she guesses that she's been putting it off. She's really sorry. Sky thinks it's cool, she's fine with it. Elle tells Sky that she values their friendship and she would hate for this to get in the way of it. Sky says that it won't. Elle gives her some advice then; just give it more thought. She's young, and should be sure before she commits to something this big. Janae's gathering dirty clothing while Boyd looks at the list of those coming to the wedding. It's pretty thin. Janae comes up with the excuse that most people don't RSVP and just turn up on the day. Erm yeah Janae! Boyd says at least the two most important people on the day will be there… that being them. Janae tells him she's see how it goes, she might have to wash her hair that day. Actually she might be there washing Toadie's stinky jocks. Yuck! Boyd tells her to leave them but she doesn't want to risk being kicked out, then gets annoyed when he still has things in his pants pocket. 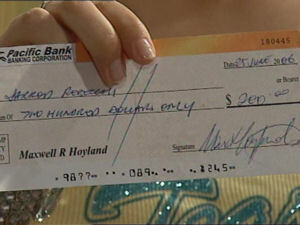 She opens up one piece of paper to see that it's a check for $200 from a Maxwell R Hoyland. Wonder what the R stands for. Boyd's wondering why his dad would be paying Toadie. Janae opens up another bit of paper and finds out it's for their rent. Boydy grabs the paper of her. BOYD: That mongrel. He's been double dipping! Boyd reads out the instruction to Toadie to make sure they know how tough being independent can be. Janae tried to excuse it that Max is trying to be thoughtful. Boyd doesn't think so, it's that his dad is trying to control him. Try and use it against him to try and make him come home. It's really about Max trying to sabotage their marriage. Summer's trying to reason with her dad about Boyd and Janae. He might not be being horrible but he's disinterested which is just as bad. Can't he just give them their blessing and say he's okay with it? Max asks even if he isn't. The head into the office, Summer asking if he has any sense of romance. They're young and in love, and it's great. Boyd comes in and sneaks to just outside the door for a bit of a listen. Max tells Summer he thinks it's great that she's being so supportive of her brother and he's sure they both appreciate it very much but there is a small thing called reality. Summer agrees, and it's that they are in love. Max says that they're young, they have no live experience to make this kind of decision. It's not a criticism of them it's just the way it is. He doesn't want them to end up broken hearted. He wants them to see the real world where you can live with someone before you rush into marriage. Ooo Boyd ain't liking the sound of that. Harold wants a talk with Lou and Mishka, motioning for them to sit with him at the table. He starts by saying he knows what they were up to while he was away. They kept a sly operation going. Also he knows he's come down very hard on the both of them in the past. He's still not very happy but he's prepared to forgive and forget. Mishka thinks this means they can start making Old 997 but Lou tells her that it means that Harold's letting them off the hook and they can stay. Harold says that there is one condition, all the money has to go to charity. Mishka doesn't want to. Harold says that's the only way they'll be able to stay. Lou thinks that's reasonable and with a little bit of encouragement, gets Mishka to also say yes and they give him their word. Harold thinks that's good because he does want them to stay permanently. Lou says that nothing would please them more. MISHKA: You have good heart. Like a pig. Harold tells them they they're both good to have around, and he has to thank them. They were there for Sky when he wasn't. And they showed themselves to be good grandparent material. Lou says it was no problem, they just had to be there. Harold thinks it was more than a fluke of timing, he showed a love and compassion better than his hard nose morality. Mishka tells him that his nose isn't that hard which makes Harold laugh. Summer's in the lounge room venting her frustrations about her dad to Bree who's in her room. She thought her dad was romantic and anyway, he and Steph eloped. At least Boyd and Janae are trying to involve everyone. It doesn't matter what age you are, you know when something is right. Summer asks when Bree is coming out she's sick of shouting. Bree comes out wearing Janelle's ‘Bogan's Tipped Hair' wig and asks if Summer likes it. She thought it was time for a new her. Summer does like it, it's a bit outrageous but unique. Bree says thank God because it took forever to glue the wig on. Summer says it's out there but it's hot. She asks if Bree has any juicy goss but Bree turns it around to Summer's goss. Oh you know, Summer almost kissed this Anthony guy but like he started seeing this Amy chick that thinks she's so good. Oh well that's Summer's goss, now time for Bree's. Janae is lazing about on an inflatable chair in the pool when Boyd bombs in clothes and all. He needed to cool down (in the middle of winter?) because of his dad. He thinks he's doing them a favour by trying to tear them apart. Boyd's had it with everyone, it isn't worth it anymore. Janae semi panics, asking what he means. He means the wedding, he thinks they should call it off. Janae asks if he doesn't want to marry her. Oh he does it's just not in front of a bunch of people that don't believe in them. He wants to go small and soon. Janae and Boyd look happy at the prospect of eloping, and Boyd knocks her intp the pool with him. Summer's shocked about Bree's goss. If she found out her parents weren't really her parents she'd die. Bree doesn't think it's that bad, she's fine. Summer wishes Bree had told her earlier so she could've helped her. Bree doesn't need help, she got brought up a Timmins so she's strong. Walking to the kitchen with Summer in tow Bree says she doesn't even want to find her real parents. They could be a bunch of losers, and she's happy with what she's got here. Bree tells her that's old news anyway, and gets out a white hangbag with a fake blue dog sewn onto it from the laundry. She asks Summer if she likes it. SUMMER: Yeah. You know what? You are the new Paris Hilton of Erinsborough. BREE: Oh yeah! But like way classier. Dylan comes out from the kitchen and Max can see he's ‘wacked'. He gives him a break because he doesn't want Dyl collapsing in the food. He heads over to Elle and she asks if he's okay. He replies that he's okay, still a bit of a head case. It's like, as he puts it, “Blaagh!” he can't concentrate at all. His head is swimming with Sky, and about him and Elle. If she wants to pull the plug he'd understand. Elle asks if he and Sky are getting back together. He says sure as soon as hell freezes over so she tells him she ain't going anywhere. She knows he's going through some stuff right now but they way he's dealing with it makes her want to be with him even more. Awww! Elle thinks he's handling people trying to tell him what to do brilliantly and it shows how mature he is. And how lucky she is to have him. They go in for a kiss but he pulls back saying he works there. Elle replies that he works for her anywhere and kisses him, saying there is no break up which is good because she has baggage of her own, be it her crazy family. 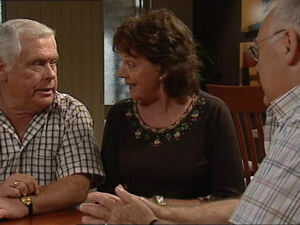 Harold interrupts this little love in asking if he can have a word with Dylan in private. Boyd's not happy that Janae told Bree and Summer about their plans. Janae defends herself by saying that they are the only two that care that they are getting married. Summer adds that they won't tell anyone. Boyd tells them all that they should get moving first thing in the morning in case word gets out. Janae asks him about her birth certificate, saying that they might be able to tell it's a fake. He says that it's fine. Summer asks if what they are doing is illegal. Boyd says they have no other option, Janae would need a court order to get married legally, Janae adding that she would need her parent's consent which of course ain't happening. And because the parents would have months to ‘work on them' before a proper wedding, Boyd thinks this is the best option. Summer asks him if it will be a bit sad without their dad there. He tells her that she heard him, they're doing this to get away from pig headedness. Summer thinks he might change his mind… Boyd interrupts saying that he might try to split them up too. Bree says that this time tomorrow they'll be getting married. In the office Harry is giving Dyl a lecture, saying he understand that it's hard for him, it's a life changing step. And he knows things have happened between he and Sky but there is so much at stake here for the child. He asks if Dylan could put aside his differences. Dylan says that he'll try and make things as good as they can be for the kid. Max interrupts accidentally. Dylan tells him they'll only be a few more minutes. Max replies it's okay, and leaves to reveal Sky behind him. Harold leaves to give them space. Sky asks if he's okay. She hasn't come to fight. He asks who's fighting, he just works there so if she's got something to say she should say it. SKY: I just wanted you to know, whatever involvement you want in all of this is fine with me. There's no pressure on you. DYLAN: No pressure? Except a lecture from just about everyone in the neighbourhood. I wonder who's next. Lynnie's priest? Dr Karl maybe? SKY: I had no idea granddad was here. No I mean it. I did this for me Dylan. So you don't need to do anything you don't want to do financially or otherwise. It's up to you. DYLAN: That's so generous of you, considering I never had a say in any of this at all. DYLAN: You knew I wasn't ready for this. But hey, what does that matter? No, it's fine, I'll be there what every second weekend? Oh that's cool never mind the fricken hole in my life. Who cares? As long as things work out the way you want them to. And with that Dylan leaves. Ouch. Boyd, Janae, Summer and Barbie Bree walk into a small little room much like the Vegas quicky weddings room, but a bit better looking. Summer think's it's a bit of a dump but Boyd thinks it's fine, it's low key. Janae says it could be a rubbish dump but they would still be happy. Random man, but according to the credits his name is Rory Grainger so we'll call him that, taking down people's names comes up to them asking who the lucky couple are. He finds their names in the book and asks for their paperwork. Boyd hands it over and Rory seems quite happy with that. He tells them there are a couple of (heh) couples ahead of them then it's hello Mr and Mrs. Boyd turns to Janae and says that this is funny it. Janae kisses him once for luck and the last time as boyfriend and girlfriend. As his wife she will kiss him any opportunity she gets. Bree spots Summer doing something sneaky and asks what she's doing. Summer replies she's calling Max and Steph. Bree says is she crazy they promised. Summer says it's tough their parents should be there, this isn't the way it's meant to happen. Boyd clears his throat and asks if there is a problem. Summer says that everything's fine but she doesn't look too convincing.